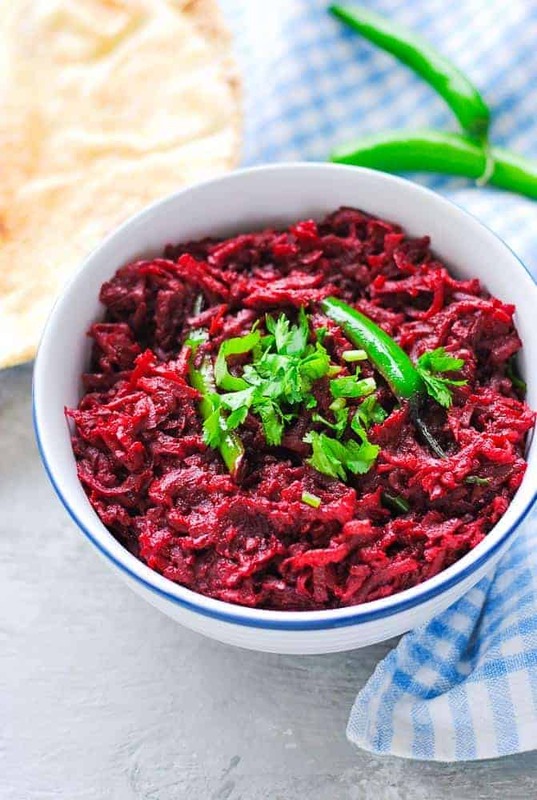 Beetroot sabzi is grated beetroot cooked in a slightly spicy onion-tomato masala. A fresh, healthy and vibrant vegetable dish that tastes divine with naan or steamed rice. This sabzi is vegetarian, vegan, dairy-free, and gluten-free when paired with rice! Let’s talk beets! Beetroots are not only chockful of nutrients, they are also very versatile. Think soups, dips, pickles, salads and stir-fries. 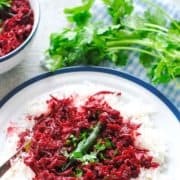 There is no end to the uses to which you can put this beautiful red root vegetable, and one of my favourite beetroot recipes happens to be the wholesome and delicious sabzi. 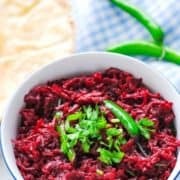 Also known as beetroot bhaji or chukandar ki sabzi (call it what you will), it is a delight to have with warm naan bread. If you have wheat allergies and still want to make a meal out of it, skip the naan have it with rice and any lentils of your choice. Check out this easy lentils recipe. And beetroots, cooking oil and salt of course! If you want to make ginger-garlic paste at home, it’s very easy! Put equal quantities of both along with a little water in a blender and whizz to a smooth and thick paste. You can store this paste in the fridge for a few weeks and use it when required. If you ask me, the the star ingredients in this recipe are the tomatoes and green chillies. It is no secret that beets are slightly sweet in taste. If you make this sabzi without the two ingredients, the sabzi is going to taste flat and quite bland, no matter what you do. Tomatoes and green chillies counter the sweetness and give it that much needed kick. Step 1: Peel and grate the beets. 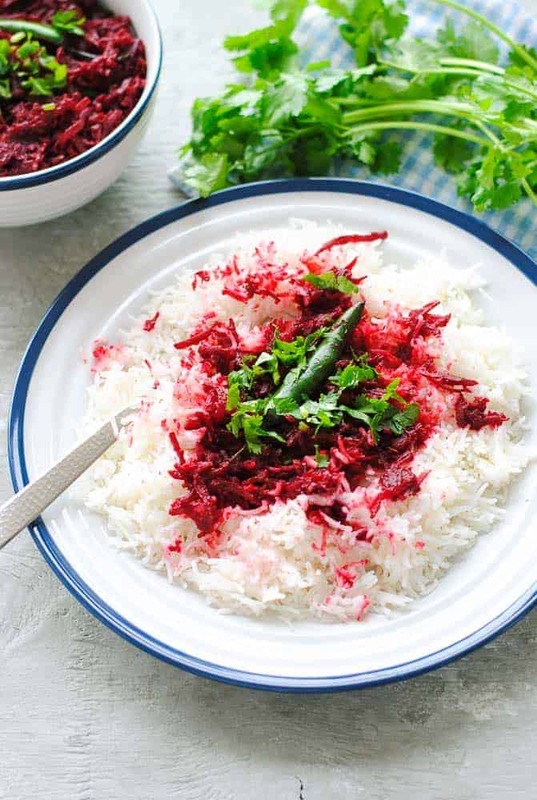 Grated beets are very easy to do in a food processor. I never grate them by hand as it is too time consuming. Step 2: Prepare the masala. Fry the onions, add the ginger-garlic paste, tomatoes, powdered spices and salt. Saute on medium heat until the tomatoes break down and the masala is cooked. Step 3: Add the grated beets and water and cook. Add green chillies in the last two minutes just before switching off the gas. Garnish with chopped cialantro. choose deep red and firm beets without leaves, not pale or soft ones. beets require some time to soften, so be patient while cooking them. It can take 30-35 minutes for them to be done. If you take them off the hob before this time, they will be a bit raw and not taste so nice. don’t skimp on the tomatoes! A little more in this recipe is preferable to less as the taste of the sabzi is enhanced by them. 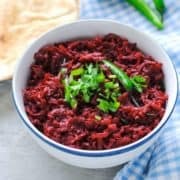 A fresh, healthy and vibrant beetroot sabzi that makes for a full meal along with Indian naan or rice. Peel and grate the beets and keep aside. Heat the oil in a pot and add the onions. Saute until reddish brown. Add the ginger-garlic paste, tomatoes, powdered spices and salt. Stir-fry this masala until thick and shiny. Add a few splashes of water if required. Add the green chillies and cook uncovered for 2 minutes more. If you don’t have powdered garam masala at hand, put some whole spices – 3 cloves, 3 green cardamom and 1/4 tsp black peppercorns. The sabzi will taste just as nice. Did you make this recipe? Don’t forget to give it a star rating below! 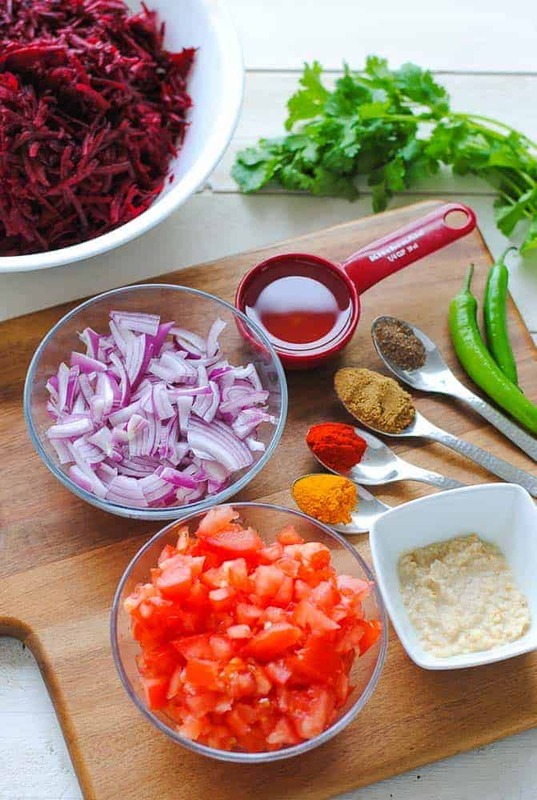 I’ve never had beetroot-sabzi, definitely looks intriguing! This sabzi looks and sounds divine. I love the colour too! Great tip about ginger/garlic paste. I normally only have fresh ginger and fresh garlic at home as ready made paste is hard to find here in Italy. Ginger-garlic paste is a cinch to make at home. I almost never buy it. I had never heard of sabzi but I love the idea of using so many beets! I’ve got a bunch to use so this recipe was perfect! If you’ve got a bunch, then this recipe is indeed perfect for using them! I am just in love with beets, and I’ll basically eat anything with garam masala in it. The flavors in this sound absolutely incredible!! I love beets but have only had them in Eastern European cooking, i can’t wait to try your recipe with new flavors. This is such a brilliant, delicious looking recipe! Can’t wait to give it a try!